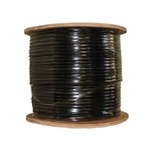 Cable & Wire - RG59-1000BLK - Only $129.95! 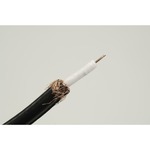 PolarisUSA is now offering RG59 cable. RG59 cable is the most cost efficient and reliable way of connecting your CCTV video surveillance system. Our RG 59 cable comes with dual shielding, including a 95% braid, to give you great signal quality by protecting your signal from electromagnetic interference (EMI). Using untermintated cable lets you decide how much you need for each application. You can also decide which kind of connecter is best for you. You can use F-type, BNC or RCA connectors. Terminating the cable is easy with our BNC or Coax connectors, available in both crimp and compression styles. All you need to do is properly strip the cable, plug it into the terminator, and lock it in place with the appropriate crimping tool.